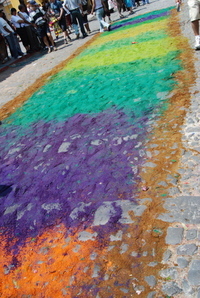 Sawdust between the cobblestones is all that is left of the magnificent carpets, and the floats have been put away until next year. After a long bus ride through Guatemala and a very bumpy and wet boat ride across the Gulf of Honduras, we arrived back in Punta Gorda on Monday evening. 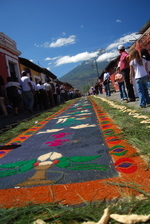 Antigua truly is a beautiful and unique place. 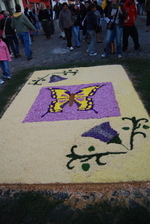 We saw some amazing things and had a great time with my parents. 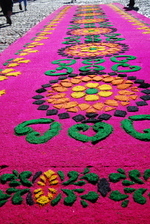 We are so glad that we were able to share such a wonderful experience with them. Easter Sunday was a beautiful day. 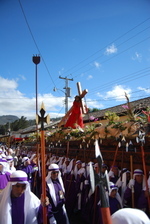 The sun was shining bright and the crowds were full of joy as we came upon the final procession of Semana Santa. Music was playing loudly, and people were singing and dancing. 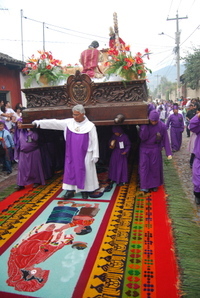 The Easter Day Procession from Hospital San Pedro Church is one of the only processions in which carriers do not have to pay a fee to participate, and men and women walk together. 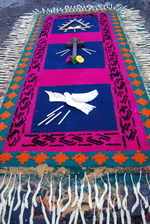 It was a upbeat end to a solemn week of holy remembrance. 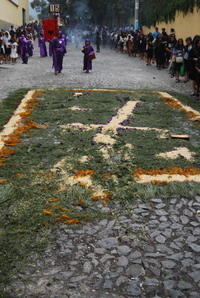 Thousands flock to Antigua for the La Merced Procession on Good Friday, the largest and most solemn of the Lent and Holy Week processions. 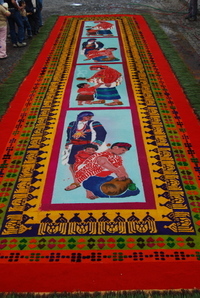 All night residents, families, and friends prepare magnificent carpets throughout the procession route. 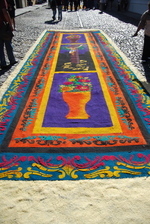 Early on Friday morning, we walked the carpets along the route, and later watched the procession. 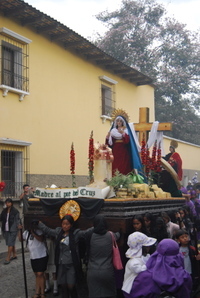 On Maundy Thursday, we also saw the procession with the sculptures of Jesus Nazareno del la Humildad, Virgen de Doldores, and the saints from the church in San Cristobal el Bajo. 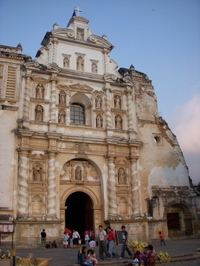 Iglesia de San Francisco is one of the many churches in Antigua. 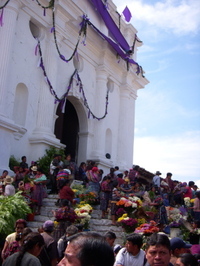 The church was badly damaged and left in ruins after the earthquakes of 1773. 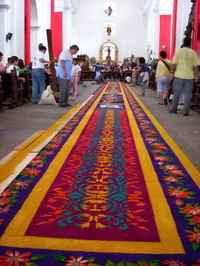 Reconstruction of the church was completed in 1970. 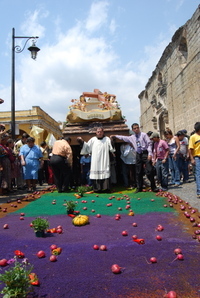 Today San Francisco Church houses the tomb of Santo Hermano Pedro de san Jose de Betancurt, a monk who founded a hospital for the poor, and Guatemala’s most venerated local Christian, who was made a saint by Pope John Paul II in 2002. 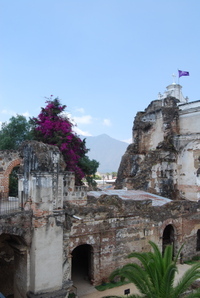 We visited San Francisco Church, the Museo del Hermano Pedro located inside the grounds, and the ruins of the adjoining monastery. 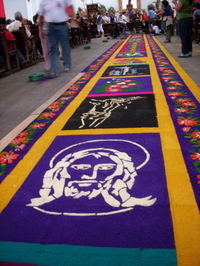 We witnessed the velacion, or holy vigil, and the making of a beautiful carpet the next day in preparation for the procession on Maundy Thursday. 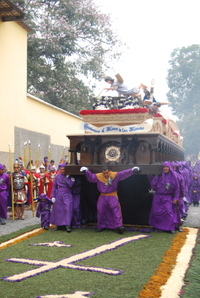 The Christ figure, Jesus Nazareno del Perdon, was sculptured in 1630 and is carried on the shoulders of 60 cucuruchos, and 40 women carry the Virgen de Dolores figure. 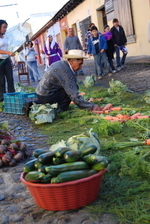 Early Wednesday morning we took a shuttle to the town of Chichicastenango, about 2½ hours northwest of Antigua. 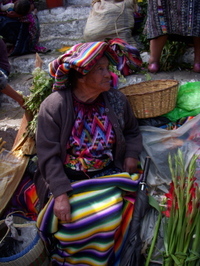 Known as Chichi, it is home to the largest indigenous market in Guatemala. 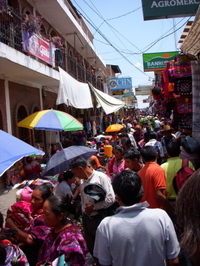 Villagers from the surrounding area come to Chichi to sell their wares and gather supplies. 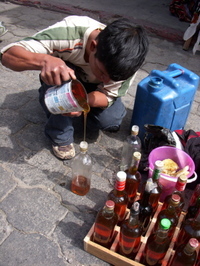 The market is usually held on Thursdays and Sundays, but due to Holy Week, it was held on Wednesday. The change in days had no effect on the market. It was incredible. 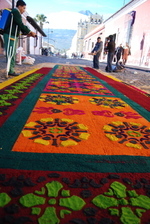 Vendors in stalls and along the sidewalk stretched for blocks, and they were all ready to make a deal. The crowd was alive and the streets were packed.